Cherubic green plantains. The flower is not a plantain flower, just for show. Banana flowers are far more dramatic. 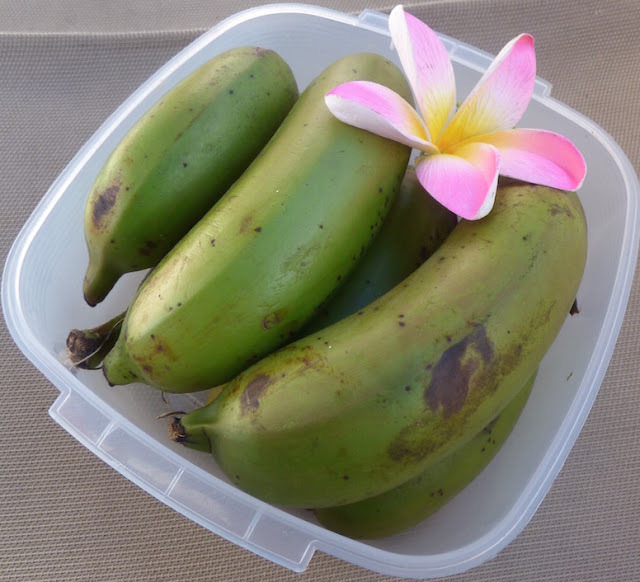 When we were given several green plantains (bananas) by villagers in Kadavu, Fiji, I felt a little conflicted. 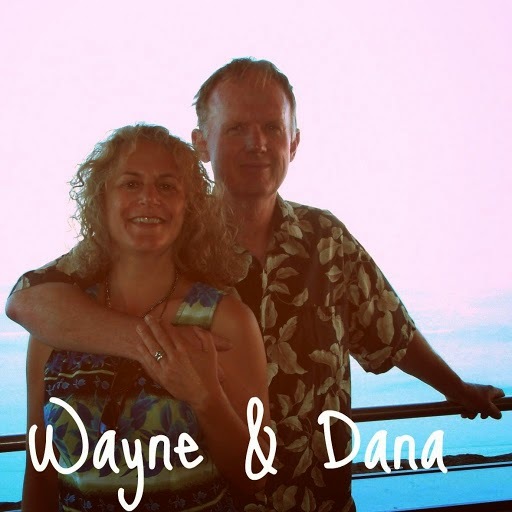 I'd cooked with plantains in St. Lucia, early in our tropical travels and wasn't wowed by the results. Ripened plantains, ready to boil. Still, when you're in the middle of nowhere (no Farmer's Markets or grocery produce aisles coming from widely spaced villages with typical populations of less than 70), any fresh produce is a treasure, not to be frittered away. We were advised to wait until the plantains turned yellow before cooking them. Usually I see plantains green, but there are sometimes sold ripened yellow, and the green ones will generally ripen in a few days. 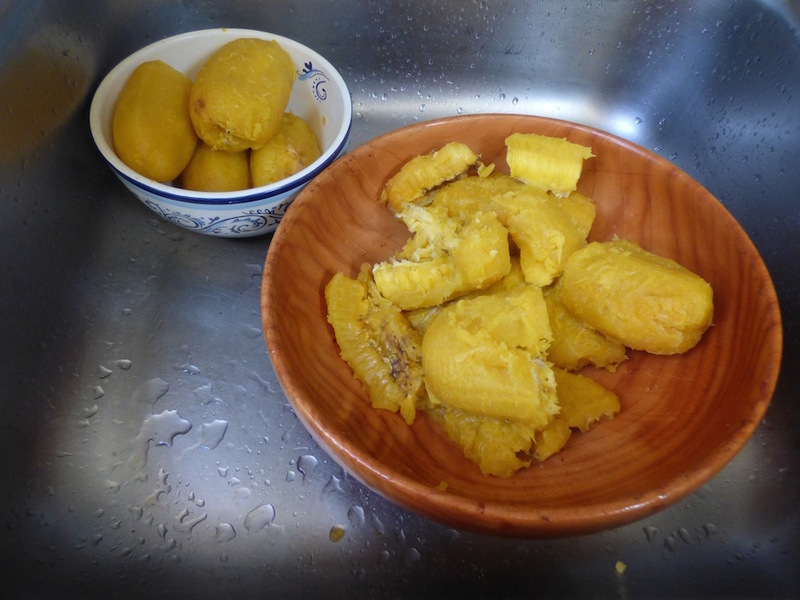 Plantains boiled, ready for skinning. 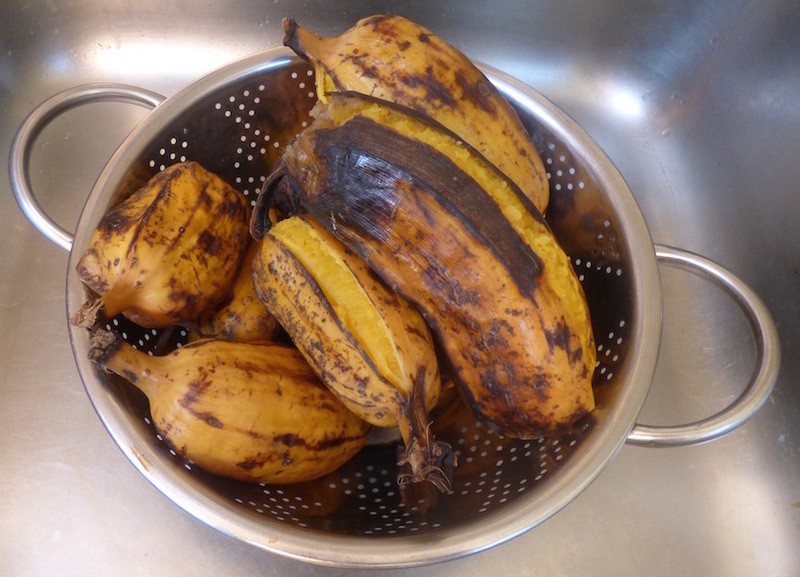 Plantains, unlike the bananas sold in USA grocery stores, require cooking before eating. My research directed me to boil them for 20 minutes, skins still on. I did - cooking them until the skins began to split. To my surprise, they imparted a delightful fruity flavor, nearly a cross between a mango and a banana, with a texture between the two. as a sweet, fruity hot breakfast gruel, with a little butter, a little brown sugar and a little lime juice - good! in an adult milkshake, with coconut milk, fruit juice and a little rum - good potential though would need a more robust blender. Mine resulted in a bit too grainy for a "smoothie." replacing potatoes in a lamb stew with plantain slices - a new Caribbean style favorite! 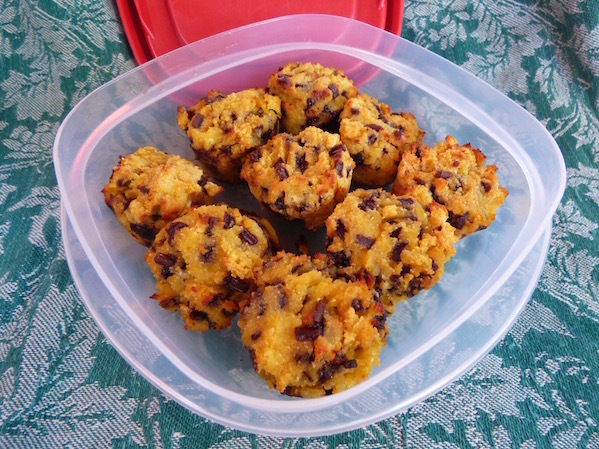 in the past, I've used green banana slices in curries - ok.
banana mini-muffins, with compound dark chocolate bits - the winner! Recipe follows. Inspired by the immense bag of gluten-free coconut flour gifted to us from another cruiser, I decided to try using that as the base to make gluten-free banana muffins with chocolate bits. A reference starting point began with the chocolate coconut brownie recipe on the back of the Better Body Food organic coconut flour package (website www.betterbodyfoods.com - they post more coconut flour recipes as well as recipes for their other products). 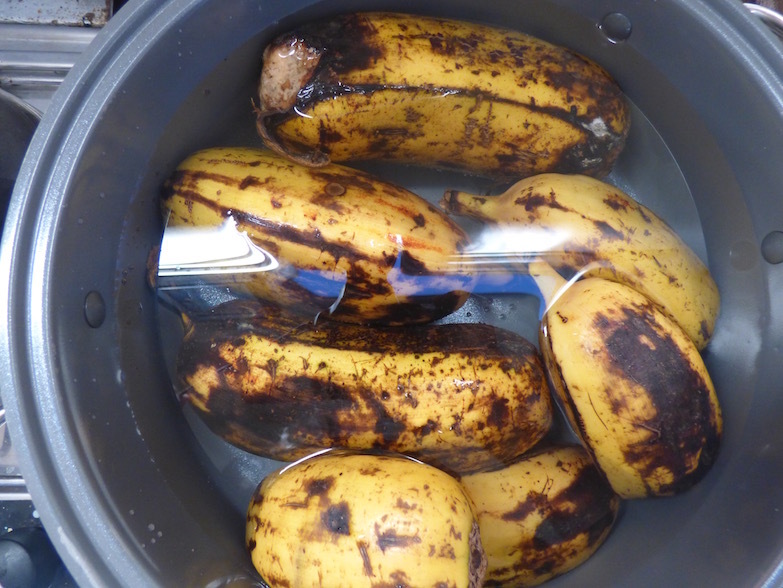 Cooked, skinned plantains, ready be mashed for "banana" chocolate muffins. Reminiscent of macaroons, these are tasty little muffins are gluten-free, but that won’t stop them from getting gobbled by everyone else! optional: for a bit fruitier flavor, add 1 T liquid tamarind paste (the one I used was a little thinner than the consistency of ketchup – most are thicker so water yours down to 1 T that consistency if you use it) along with the vanilla. *xanathan gum helps hold together recipes that otherwise might rely on the glutens in flour to hold the structure of the baked good together. I have not tried to make this recipe without xanathan as I have plenty on tap. If you don't have xanathan, try skipping it, it might be fine. Beat eggs. Add brown sugar and vanilla. In a separate bowl, mix the remaining dry ingredients (coconut flour, salt, baking powder and soda, xanathan gum) thoroughly. Add the egg mixture to the dry ingredients and mix thoroughly. Add the oil and milk and mix thoroughly. Add the compound or mini dark chocolate chips and mix thoroughly. Spoon into muffin tins* and bake in preheated oven for 20 minutes** (or until the tops are firm), rotating their position 180 degrees in the oven halfway through. *I use silicon mini-muffin pans. They do not require any grease for its contents to come out clean. **Your bake time may vary, depending on the size and composition of the muffin tins you use. Pyrex tends to cook faster, metal, slower. Ta-da! Macaroon-like "banana" muffins with chocolate. Delish and gluten-free! Have you cooked with plantains? What did you make? How did it turn out? What other exotics challenged your cooking prowess? 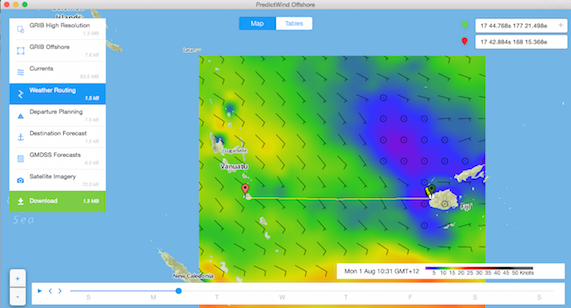 Predict Wind application forceast for our upcing departure from our current location of Vuda Point Fiji, to Port Vila, Vanuatu. We are still in Fiji, currently in Vuda Point Marina (S17.40.820 E177.23.169) just outside Lautoka. 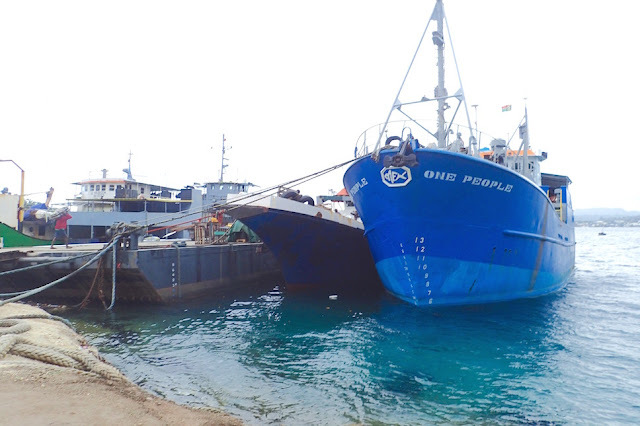 We're preparing to make our jump from Fiji to Vanuatu this Monday, August 1, 2016. We were in the Kadavus (where we got our 1st Fijian plantains) in June, and in July found more plantains at the market in Labasa, a bus trip from Savusavu. I did not see plantains in Lautoka's market, though did find my old favorite, the alien-looking soursop.